We recently attended Rotman School of Management’s Lifelong Learning Conference and left with a pile of books we can’t wait to dig into. Four titles set to challenge our creativity, expand our views on innovation and help us understand the opportunity technology provides us. Melissa A. Schilling is one of the world’s leading experts on innovation. A professor at New York University Stern School of Business and author of the infamous strategy textbook, Strategic Management of Technological Innovation. 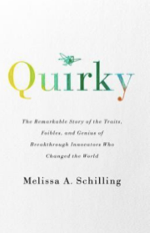 In this new book, Schilling takes an in-depth look at the lives of eight prominent serial innovators — Albert Einstein, Benjamin Franklin, Elon Musk, Dean Kamen, Nikola Tesla, Marie Curie, Thomas Edison, and Steve Jobs. Beyond intellect, she seeks to discover what makes these innovators so great. 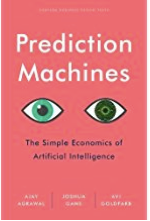 Already a bestselling title, Prediction Machines aims to help readers overcome their fear of AI. The authors show us how basic tools from economics can help us understand the AI revolution and capitalize upon its huge potential. A must read for CEOs, managers, policy makers, investors and entrepreneurs. 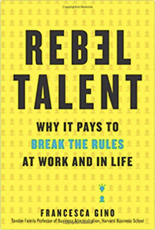 Award-winning Harvard Business School professor Francesca Gino wants us to rethink the term ‘rebel’. Instead of rebels being the outcasts, the contrarians and troublemakers maybe we can see rebels as the ones who change the world for the better in sometimes unconventional ways. Francesca wants us to uncover the rebel within, break the rules and find success in every aspect of life. 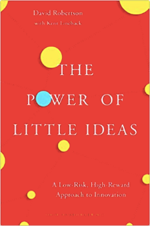 The Power of Little Ideas offers a different perspective on innovation – a low-risk, high-reward approach. Robertson and Lineback argue that there is a big flaw in innovation thinking today. There’s a notion that the only successful innovation is disruptive innovation. The authors argue there is a Third Way- a way to build complimentary innovation that can deliver competitive advantage.